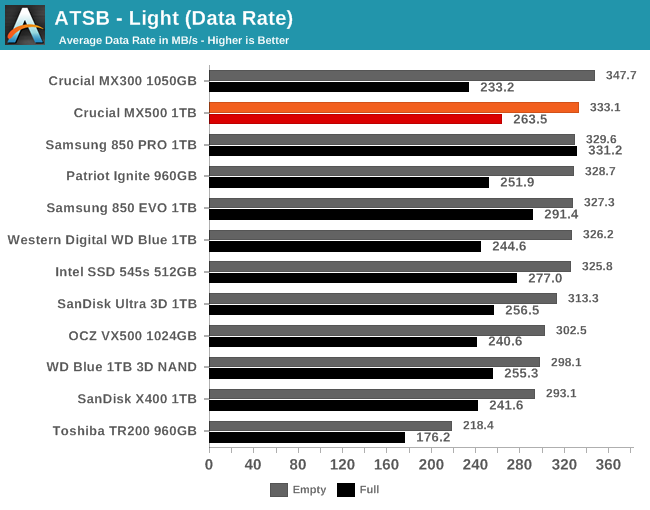 The Crucial MX300 performs very well on the Light test with an average data rate that the MX500 cannot quite match, but the MX500 doesn't lose as much performance when the test is run on a full drive. 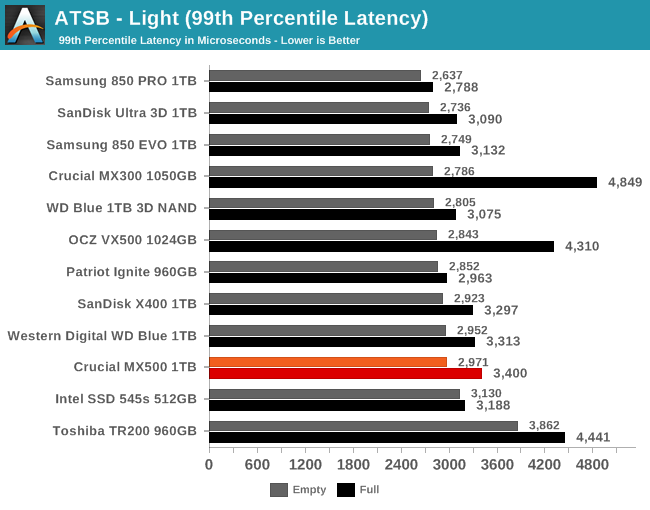 The average and 99th percentile latency scores of the Crucial MX500 are largely unremarkable, though the 99th percentile latency is near the high end of the normal range. 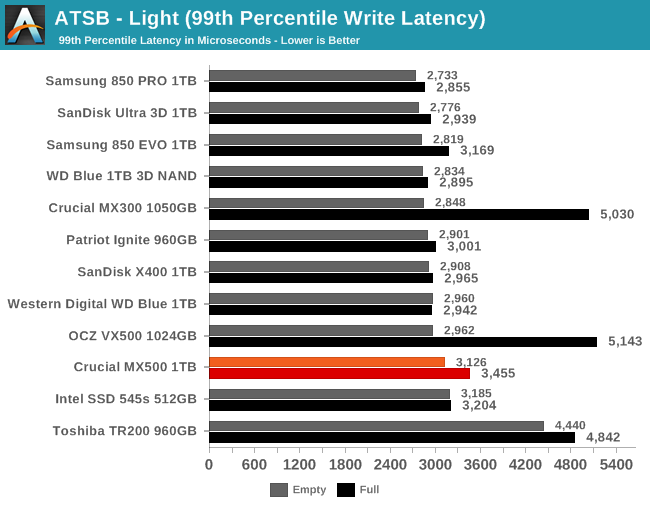 The MX500 is a substantial improvement over the MX300 when it comes to full-drive performance. 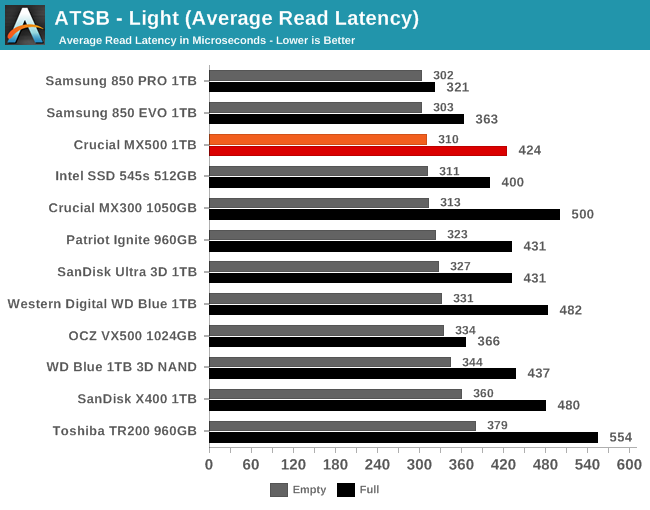 The average read latency of the Crucial MX500 on the Light test is close to the Samsung 850 PRO and EVO when the test is run on an empty drive, but is merely average when the drives are full. 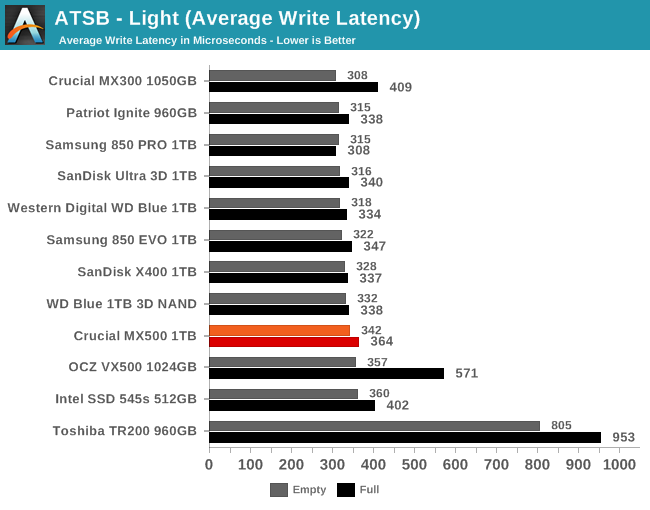 The average write latency is a bit below average in both cases, but the full-drive penalty is much reduced compared to the MX300. As with the average read and write latency scores, the 99th percentile read and write scores fall within the normal range. 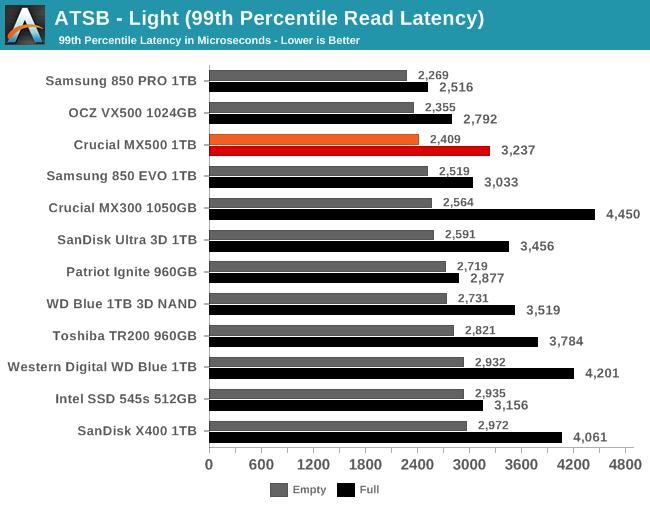 The 99th percentile read latency is a bit better than average while the 99th percentile write latency is worse than most drives, but the MX500 isn't an outlier in either direction. 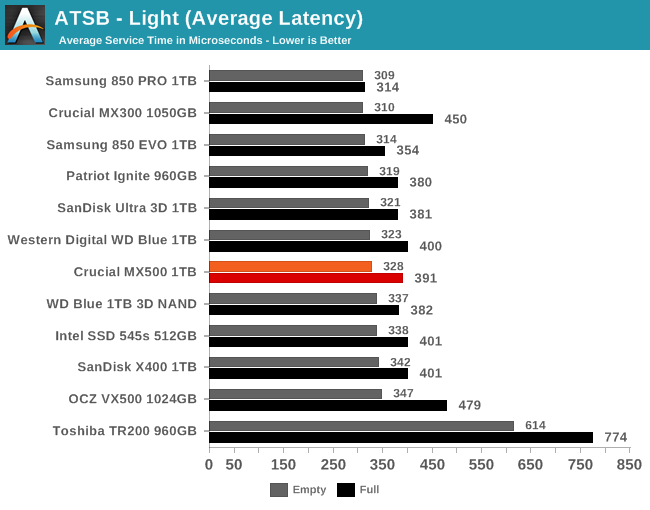 The power consumption of the MX500 ranks a bit better on the Light test than it did on the Heavy test. 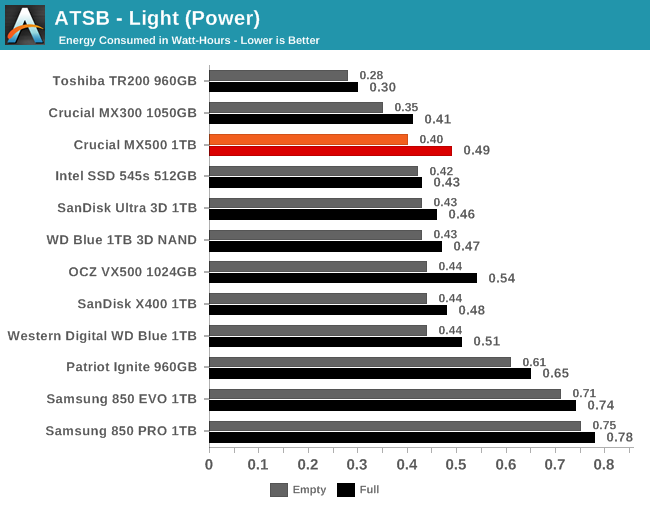 The Crucial MX300 is still substantially better, and the slow but DRAMless Toshiba TR200 holds on to a comfortable lead. The Samsung 850 PRO and EVO are in last place.